What is your child’s favorite fruit? Mango would be the most popular answer here! 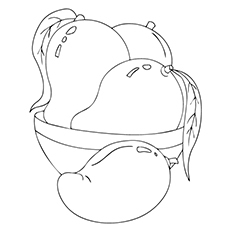 Are you looking for interesting mango coloring pages free to print for your little one? If yes, then you have come to the right place! Mango is the most cultivated fruit in the world. The fruit is native to South and Southeast Asia. Mango is the national fruit of India, Pakistan, and Burma, but its popularity among the kids is not just limited to these regions. As summer arrives, kids start craving for fresh mango juices and ice creams. Here are 10 mango pictures for coloring for anyone who loves mangoes and other fruits. Peep on! Do you want to teach your little one how to write in a fun way? 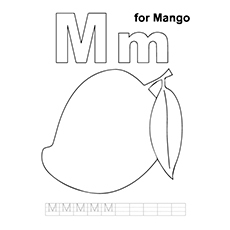 Then give him this M for Mango coloring sheet. Have him to trace the upper case M at he bottom of the sheet. He can then fill colors in the fruit and upper and lower case M.
Do you want to inculcate healthy eating habits in your child? Then here is a bowl of three mangoes for your kids to enjoy. This fruit contains plentiful nutrients that will help your child grow healthy. This coloring sheet will put your child in the mood for a fruit snack when he is all done. Where is this mango going? Is he trying to keep people from eating him? But he looks quite jubilant in the picture? Perhaps there is some other reason behind it. This cute mango is also wearing a hat to protect him from the sunrays. He is certainly one smart mango. 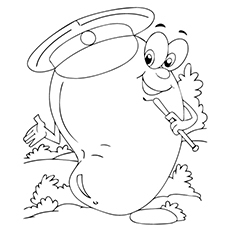 This coloring sheet will surely make your child giggle with joy. 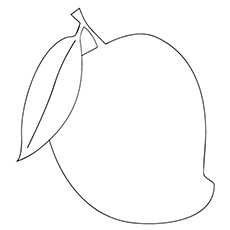 Here is a simple mango coloring sheet for younger children. Allow your little one to choose whatever color he likes. Do not limit them to just yellow or green. Let him experiment with blue, red, pink or whatever color he likes. 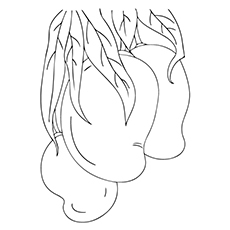 This coloring image shows mangoes hanging from its branch. Mango trees grow up to 30 to 40 meters. In our childhood, most of us have tried climbing and stealing mangoes from the trees. Does your child do the same in his school? You can share some of your childhood mango memories with your kid while coloring. 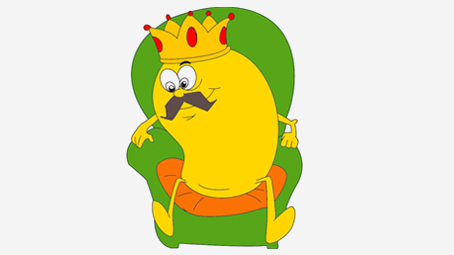 Here is a coloring sheet of Mango, the king of fruits, sitting on his throne. Do you know why mango is the king of the fruits? Mango is the king of fruits because it is a rich source of all the necessary nutrients required for the well-being. And how can we not mention its yummy taste? Its flavor appeals to people of all ages. 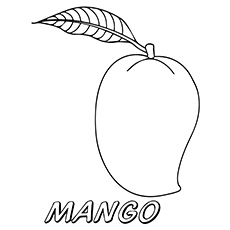 There is no better way to teach your child about mangoes than by giving him this coloring sheet. Encourage your child to use tropical colors for this image. Also, tell him what a mango flower looks like before the fruit appears. Here is a coloring image of a delicious mango that will make your child salivating for a healthy treat. The simple outline of this coloring sheet makes it a good page to use for projects once it is finished. The scene is from Disney’s “Jungle Book”. 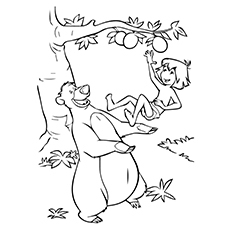 It shows Baloo trying to help Mowgli gather mangoes. Mowgli is a little child raised by a pack of wolves in a jungle. Baghira found him as an infant in a battered canoe. 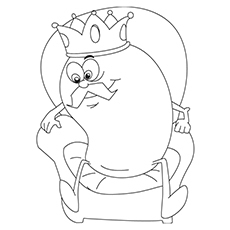 There are many details in the coloring sheet that your older kids will appreciate. 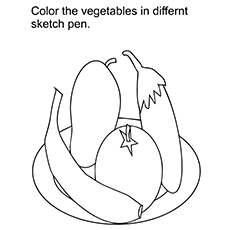 This coloring sheet features three veggies and a mango. Have your child paint these vegetables and fruits in their real color. Also, make him write the names of the veggies and fruits below the images. Encourage your child to talk about everything that he knows about these vegetables and mango. So why wait! Tell your child to break his orange, green and yellow crayons on these free printable mango coloring pages. 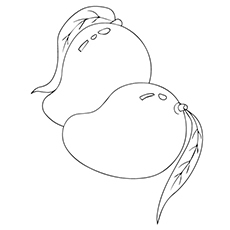 These mango coloring sheets will make excellent educational activity during the summer vacation when children want no other fruit, but mango. Which fruit does your child like the most? Is it mango or some other fruit?